One of the most distinctive features of this shrub-like cactus is its charming apricot to orange colored blooms. Plants burst into bloom in spring and early summer; flowers are followed by purple pear shaped fruits called tunas. The edible fruits offer beautiful color and a flavor similar to watermelon. The stems, or pads, are also edible and when cooked are called nopales or nopalitos. Fruit can be harvested all the way through fall. Plants can grow to 5- to 6-feet tall fairly quickly, but then growth will slow down; after which plants can eventually grow to 15-feet tall. Plants typically spread to about 5-feet wide. 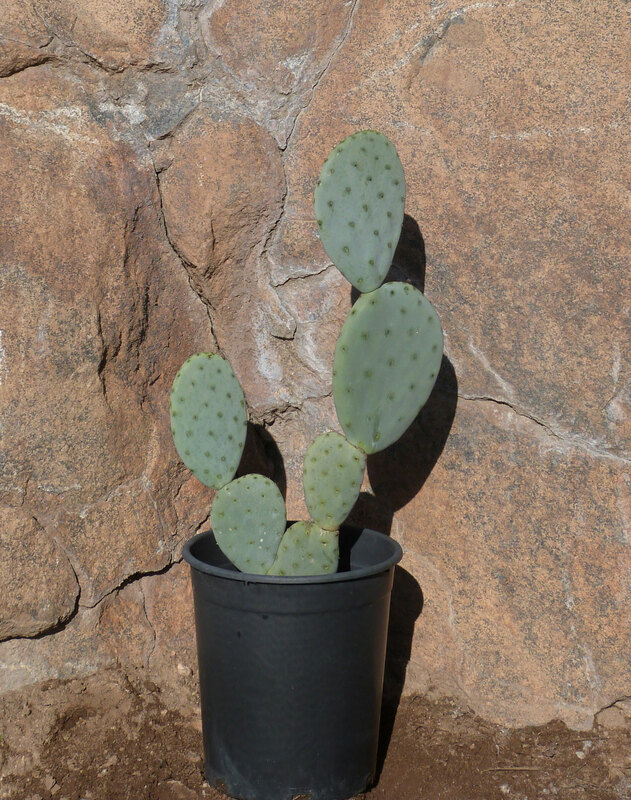 While still commonly called “prickly pear”, this variety of opuntia is nearly spineless, making it a good option for public or higher traffic areas. ‘Burbank Spineless’ can be used as a screening plant or simply as a featured focal point. Plants need minimal water once established and won’t thrive in soggy soil. They thrive in the hottest parts of the landscape in poor, sandy or rocky alkaline soils.